Today Barb and I met at the Curious Sofa. As we walked around the shop, looking at everything I explained to Barb why I need an extra 10 IQ points. Yesterday I decided to try and put a roof on my binderboard bee nest boxes. I have about 6 of these boxes for our native leaf cutter bees. These non-aggressive bees are a favorite of mine. They don't make honey for human consumption...but they do pollinate my gardens. One of the binderboards needed a roof so I decided that I could make one from a plastic circular lid and a bungee cord. Needless to say the circular lid and bungee cord went flying and cut my lip. I'm sure those extra 10 IQ points would have helped me realize my plan wasn't sound and saved me from a fat lip. I seem to be loosing IQ points instead of gaining them... (the wine at lunch didn't help either) Oh well.....back to the main theme of the post. Holiday Tables! Barb found this wonderful cabinet at Curious Sofa. She thought it would be great for one of our booths at market. We loaded it into my car and was going to take it to the warehouse for storage. But instead I thought....hey I'll put it out in my backyard and use it as a prop for some table settings I wanted to show you. The above shot is the cabinet with the serving pieces I thought I might use in the photography. When we get ready to do photography, I usually get out everything but the kitchen sink. Never use it all....but just in case I want to have it handy. 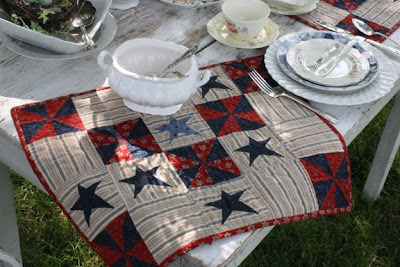 Barb has made some wonderful table toppers and placemats just right for the 4th of July. These placemats were easy to piece and applique. They are quilted by hand using the long stitch. After making my husband help me get the cabinet out in the yard we then carried a table and a couple of chairs out there too. I got my chandelier from the back porch and hung the chain over a tree limb for a bit of atmosphere. Tried to light the candles....but it's just too windy right now. You will have to pretend they are lit. 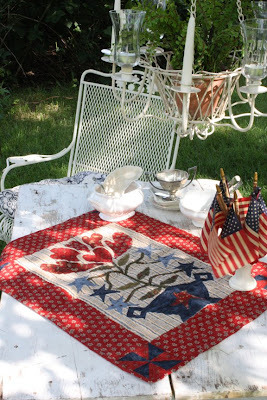 This small quilt makes a great table topper. Eating out on the dock at the lake? This one's for you! This flower table mat and all of the other projects shown in this post were taken from our book "Small Favorites for All Seasons." It's about dinner time here....my husband is going to grill and we are going to eat out back...and then take it all back inside. Hope you have a wonderful 4th. Hope you are able to take a bit of time to carry your table outside and enjoy the weather! Oh my everything looks so pretty! I love the quilts and the placemats. They are just perfect for this time of July. The chandelier is such a nice touch, and I love mismatched china. What wonderful table settings! Have a very Happy 4th of July! Ack! How do you always make everything look so perfect? I love those quilts -- shows you what happens when I don't quilt for a few years. I discover all these quilts I want to make! :D Hope your lip is better. If you are losing IQ points, you're in good company. I have read many many blogs where loose rhymes with choose. (Lose rhymes with choose.) But look what good those IQ points do me--I'm a pedant. Alma - I suppose a fat lip is better than poking your eye out! A cool glass of wine will help with any swelling and/or pain!! 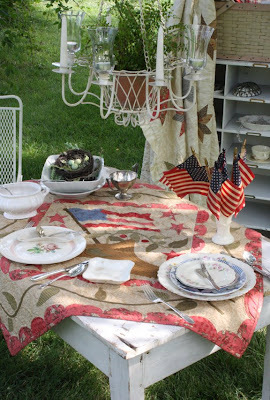 Love the quilts and your table settings. Just beautiful. Have a wonderful 4th of July!! I'm so glad I found your blog! I just did a post asking for help finding one of your books, Hidgon Camp 1924. Is it impossible to find? If you would be so kind as to check my blog post. 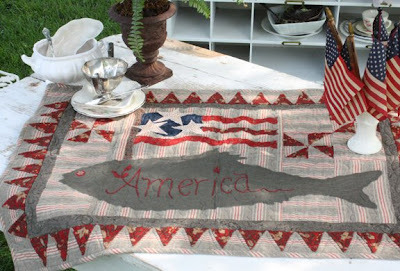 I show a flag quilt that I believe is in that book and I would like to know if it is for sure. Thank you so much and I think your work is just MARVELOUS! When I look at these beautiful tables and try to picture my gang eating off these great dishes and placements, well, let's just say I can't picture it! But I think the girls would love it, so I may just give it all a try; you are inspiring me! Hopy you and Barb have a happy 4th with your families. Beautiful quilts! I love dishes too!! Happy 4th to you, Barb and your families!!! Cari...you are too funny! I'm really glad I didn't poke my eye out!!! A glass of wine does cure all. Miss Jean...."Higdon Camp 1924" is sold out. The flag quilt from that book is the one I should have pictured....but since the book is not available I hated to picture it on the blog. Wow! Alma. I now have a serious case of quilt celebrity shock. Thank you so much for taking the time to answer me about my quest. I will find it!!!!! I'm sorry about your lip...we live on a farm and it seems things like this always happen around animals...oh the stories we could tell! Big smile. 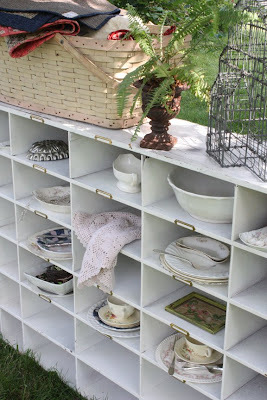 I just love this post...the quilted items, the tablescapes, that cabinet! Oh my the things you can do with that cabinet! Just incredible...my mind is a whirl. those placemats are beautiful! Wow, love the photos. And the display piece. Poor lip, hope it gets better soon. i want to come over... how wonderful you are to decorate for one meal!! i'm sitting outside with 3 laptops... not so cute... LOL! Love your table settings. Everything is just so beautiful. I just found your blog while reading Pat Sloan's and I must say I am now a fan! 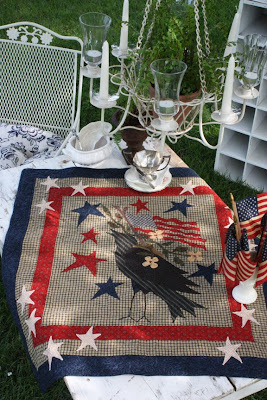 Love the beautiful patriotic photos and the small Eagle quilt is wonderful! I think you made a wise choice keeping out the white cabinet for photos! Thanks for the patriotic boost to my day! LOVE the quilts - will need to get the book. The settings were just beautiful. Oooh, I hate when accidents like that happen! Your table settings are gorgeous and boy, you sure are making me want to learn quilting with all those beautiful quilts you're showing. Very pretty and very inspiring! What a great find with the cabinet. 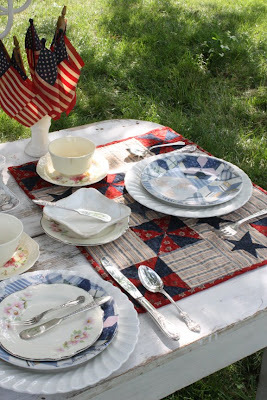 Your table settings look so pretty and the quilts are just wonderful!! Miss Jean - I love the Higdon Camp Flag quilt. Me and a few of my friends are currently making that quilt. You will find the book and will enjoy making it. Is this a new book? If so, has it been released or when will it be available? I have so many of your books. Each one has at least one project I hope to do. Time is running, tho' unless I can live to be 100. Your photo styling is wonderful! Your table setting looks so pretty and inviting, I wish I was that talented. What a sweet hubby to carry things out for you. I love the chandelier, such a nice touch. I'll be right over for lunch. Oh, wow. Wow wow wow wow. I don't know what is more incredible--the tablescapes or the quilts. Together they are just awesome. Wow. I hope you had a happy 4th! This is one of our older books ...it was released about 3 years ago. My husband and I had dinner out in the backyard. Then he had to help carry it all back in....I think we should eat outside all the time now. We seem to talk more and look around and notice the wildlife. Lunch will be ready when you get here....you might have to help carry out the tables though! 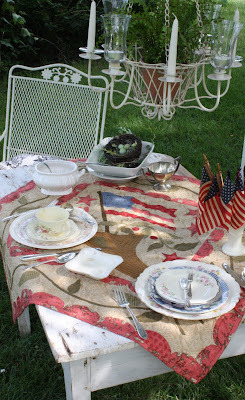 Thank you so much for posting photos of your America vignette. First time to your blog. 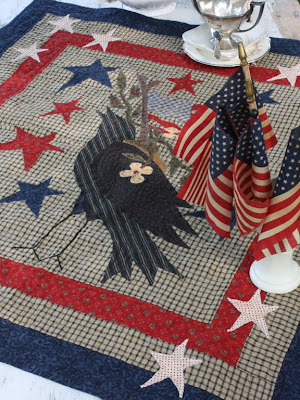 I love your July 4 table designs, and the quilts are stunning and make me proud to be an American! Keep up the beautiful work. I am looking forward to following your blog. Those quilts are truly amazing and colorful. Lovely designs! Can't wait to see more updates about your progress on making this quilts!